Patti and Laura shared their most used and recommended shears in a previous blog post. Wubbers does not manufacture or market shears, nor are we affiliated with any brand of shears, but we definitely use shears. Along with our recommendation we made the exciting announcement we are giving away a Free pair of Wubbers Pliers! Visit our Facebook page by clicking on this link and share a little bit about your favorite shears. If you don’t have any, simply post a friendly hello. If you are not on Facebook, we don’t want to leave you out, so just shoot us a quick email (info@wubbersu.com). We will combine all the names and will randomly select one person to receive a brand-new pair of Wubbers pliers. Winner will be announced in a live Facebook post on April 19, 2019 starting at 12:30 pm. Share on our Wubbers University Facebook post a little bit about your favorite shears. If you don’t have any, simply post a friendly hello. If you are not on Facebook, write in an email to info@wubbersu.com with a little bit about your favorite shears. If you don’t have any, simply say a friendly hello. Adults, ages 18 and older, are encouraged to enter. Deadline for submissions is Midnight CST, April 18, 2019. Winners will be notified through private email and/or private message on Facebook. Check our Facebook* page at www.facebook.com/WubbersU for giveaway updates and announcements. Participants must be willing for their name to be posted on our websites, social media, and/or in our newsletter. *This promotion is in no way sponsored, endorsed or administered by, or associated with Facebook. You understand that you are providing your information to the owner of this Facebook page and not to Facebook. **By submitting your written entry, you are acknowledging you agree to the above Terms and Conditions. It depends on the job that you want to do. Wubbers does not manufacture or market shears, nor are we affiliated with any brand of shears, but we definitely use shears. We (Laura and Patti) have searched high and low for shears that work well for our own jewelry making, and we want to share those with you. We use two shears about 95% of the time, and they work well for most of the projects that we design. On the left is the Lindstrom Shear and on the right is the ProShear. These two shears used in tandem will complete many, many cutting tasks. For comparison, the length of the Lindstrom shear measures in at just over 6 inches while the ProShear measure about 7.75 inches. The Lindstrom Shear is our go-to shear for making flush cuts when making jump rings or wire links. It has soft cushy handles and feels so nice in your hands. It comes as close to making two flush cuts as any cutter that we have found other than a jeweler’s saw. Sometimes it’s faster and easier to just grab our Lindstrom shears and snip. This shear works great with bezel wire as well as non-ferrous 20- and 18-gauge wire (that means no steel!). It works good with 16-gauge wire, but sometimes does leave a small divot when the jump ring or wire link is closed. However, we have found that when fusing Argentium Silver®, and especially when plans include hammering and texturing, the little divot virtually disappears. We have cut 14-gauge wire, but sometimes it requires a little clean-up. We can tell you more about the best options for “a little clean up” in the next newsletter! What about cutting sheet metal? Now that’s a different sport. While we absolutely love the Lindstrom Shears (and protect them fiercely from unscrupulous family members! ), we have found that the blades are a bit short for the most effective cutting of sheet metal. That’s when we pull out our trusty ProShear Sheet Metal Cutters. The length of the blades of the Lindstrom shears (left) are about 1 inch, while the ProShears’ blades measure in at about 1.9 inches. The ProShears look like the big brother to the widely-used Joyce Chen Unlimited Scissors that metal workers often have on their workbenches. The Joyce Chen Shears measure about 6.25 inches in length as compared to the 7.75 inches of the ProShears. The length of the blades on the ProShears makes it easier to cut sheet metal, and while not padded, we find the grips to be comfortable. These shears are longer overall and offer a bit more leverage that the Lindstrom cutters. Both the Lindstrom and the ProShears are rated to cut up to 20-gauge non-ferrous sheet metal (again, non-ferrous metals do not include steel). The Lindstrom Shears cutting 24-gauge sheet metal. The ProShears cutting 24-gauge sheet metal. One full snip using the Lindstrom Shears (left) and the ProShears (right). So now that we have offered you a solution, let us offer you a little something else. Visit our Facebook page by clicking on this link and share a little bit about your favorite shears. If you don’t have any, simply post a friendly hello. If you are not on Facebook, we don’t want to leave you out, so just shoot us a quick email (info@wubbersu.com). 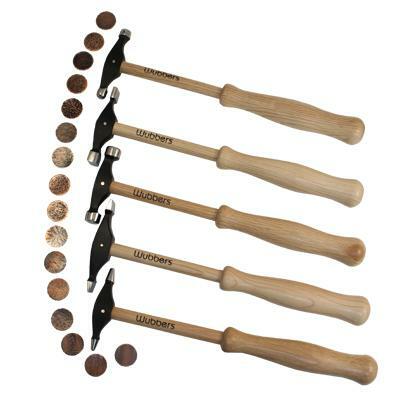 We will combine all the names and will randomly select one person to receive a brand-new pair of Wubbers pliers. We can’t wait to hear from you, and stay tuned to next week’s tool-making tip on how to get 16- and 14-gauge jump rings and wire links to close up perfectly! Set your Wubbers Parallel Pliers to desired width. Begin to wrap wire around both jaws. As you wrap be sure to work your way down the jaws toward the base. This will allow you to slip off the coil while continuing to make it longer. Be sure to not squeeze the handles while wrapping the coil. Continue to wrap down the jaws until you run out of space. Gently squeeze the pliers to allow coil to partially slide off the end. Continue to wrap the coil. Continue to make the coil until it is approximately 4 inches long. Begin to unfold the coil by grasping two links at a time. Separate the first two from the coil by unfolding them as you would open a book. Now take the next two links in the coil and fold them the opposite direction. Take the next two and fold them back the direction of the first two. You will continue down the coil in this accordion style unfolding process until the coil is completely unfolded. Note: Do not worry about unfolding the bracelet completely flat. You will flatten it in the next step. Once the coil is completely accordion folded. Flatten out each section of links using your hands. Once it is mostly flat, gently tap the links with your mallet. This will flatten the bracelet nicely while also work hardening it. After flattening the bracelet, curve the links into a bracelet form. Take one end of the bracelet and completely unwind the last set of links. Straighten the wire with your Wubbers Wire straighteners. Cut the long end of wire that has been straightened down to a little over 1 inch. Grasp the wire a quarter of an inch below the loop with the larger jaw of the Wubbers Medium Round Nose Pliers gripping the top and the small jaw gripping the bottom of the wire. Now roll the wire around the pliers until the loop reaches the center of the last set of links on the bracelet. Using flush cutters, trim extra links off of the opposite side of the bracelet from the clasp to reach desired size of bracelet. Using 26 gauge wire, string beads throughout each desired link of the bracelet. Continue around the bracelet until you are finished. Would you like to be featured as a small business on our Facebook page, blog and possibly newsletter? If so, please email info@wubbersu.com. Include your business name, links to your website/Etsy store, etc., a short biography, and no more than four pictures. We believe this will be a fun way to get to know others in our industry while encouraging all jewelry designers/makers to pursue their passion. Submitted jewelry entries, created by the participant, must include the color turquoise in the design through the use of beads, cabochons, gemstones, etc. 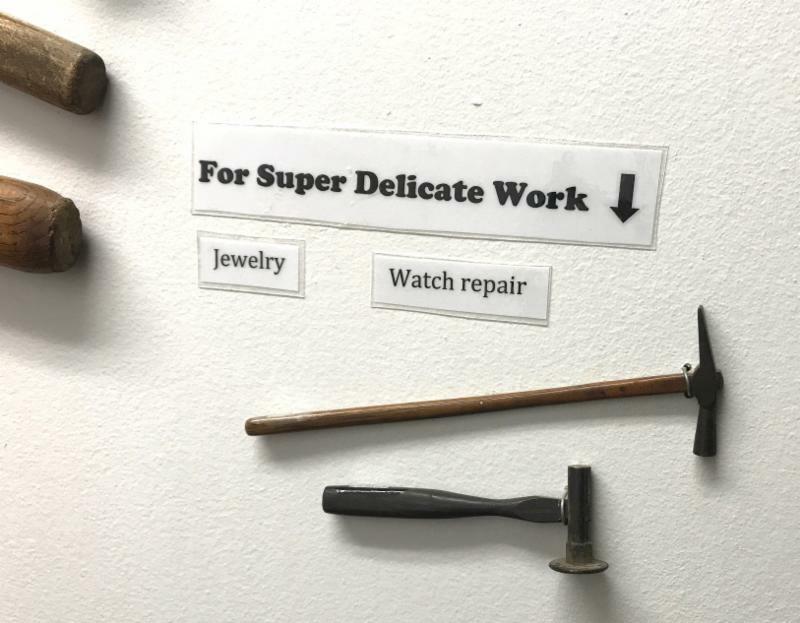 For jewelry entries made with only metal, participants must include a pair of Wubbers pliers in the photograph with the jewelry. The turquoise handles of the Wubbers pliers will qualify the metal jewelry as a submission. 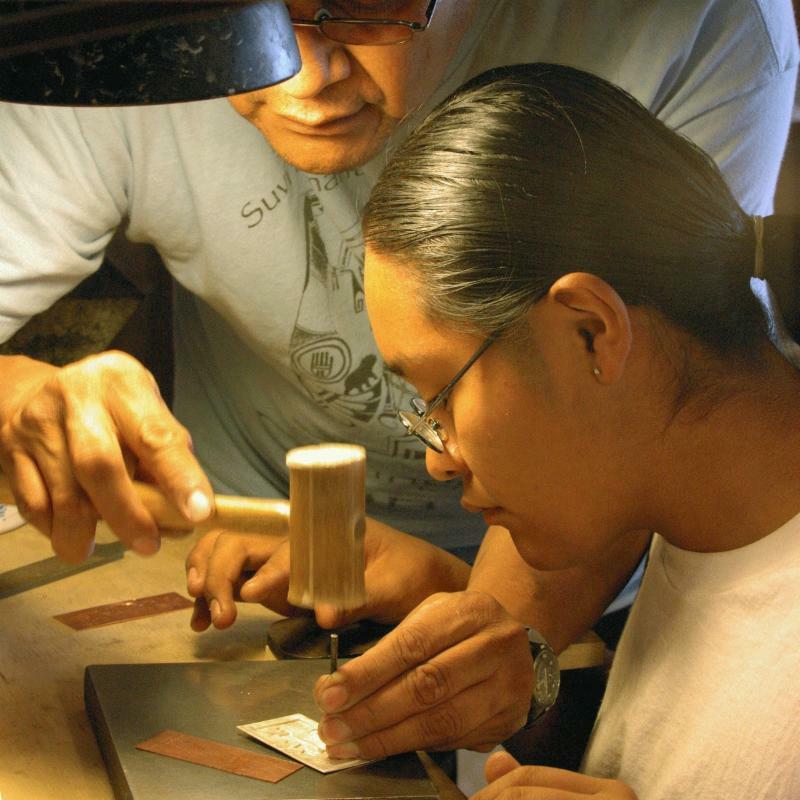 Jewelry makers of all levels, ages 18 and older, are encouraged to enter. If an entry is created from a tutorial or inspired by an instructor’s work, please give appropriate credits in the description of your piece. Send one photograph per email entry along with your name, phone number (for notification only), and a short description of the piece to info@wubbersu.com. Feel free to submit multiple entries in separate emails. Email entry must include the words “Teeny Tiny” in the subject line. Deadline for submissions is Midnight CST, October 4th, 2018. Winners will be notified through private email and/or phone call on October 6, 2018. Check our Facebook* page at www.facebook.com/WubbersU for giveaway updates and announcements. Participants must be willing for their name and photo entry** to be posted on our websites, social media, and/or in our newsletter. **By submitting your photo entry, you are acknowledging you agree to the above Terms and Conditions. Nestled among the mountains and the brightest of blue waters of the Chilkat and Chilkoot Inlets off the Gulf of Alaska, sits the most curious of museums. A true one of a kind in the world. It is the Hammer Museum in Haines Alaska. 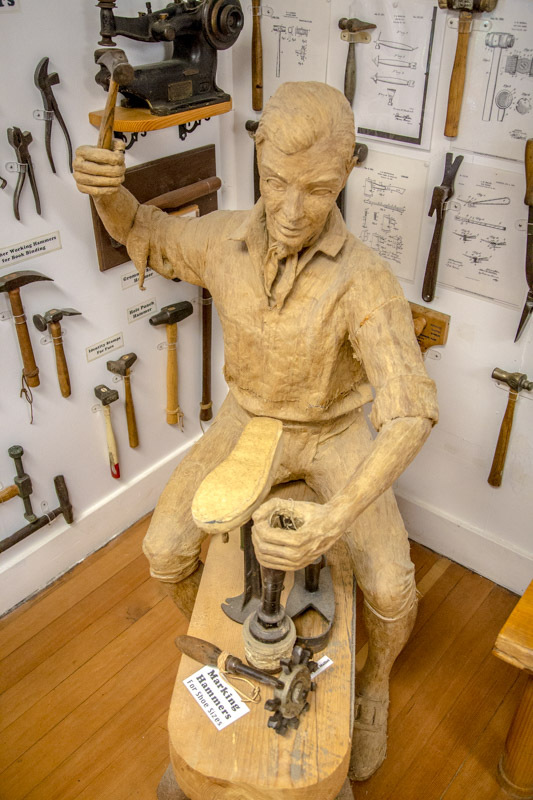 With over 2,000 hammers on display, the amount of artifacts in this museum easily outnumber the 1,731 residents of Haines. Since opening its doors in 2002 to both residents and the thousands of tourist who come by each summer on cruise ships, the Hammer Museum has provided hours of educational entertainment to young and old alike. Recently, Patti and her 10 year old grandson, Mikah, were able to explore the Hammer Museum together. 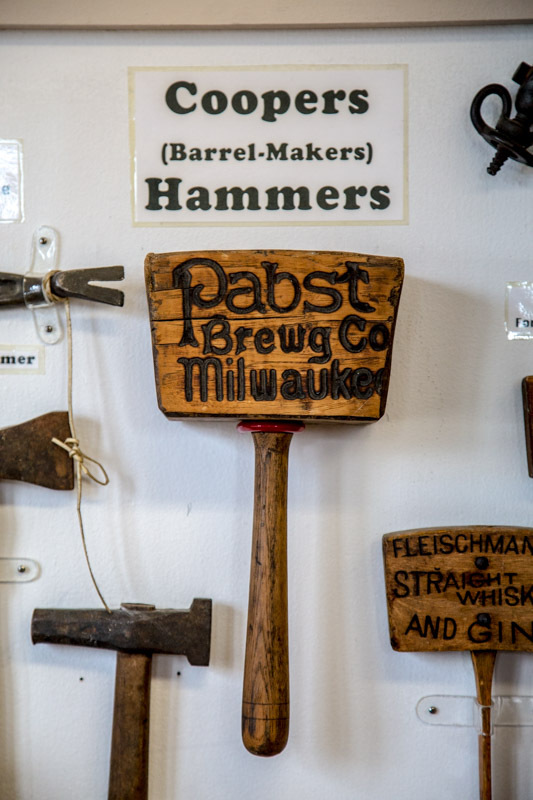 And for all of our Bead&Button friends, they even found the perfect hammer from Milwaukee. There was only one thing the Hammer Museum was missing. Patti and Mikah searched high and low. However, they could not find Wubbers Artisan’s Mark Hammers anywhere in the museum. 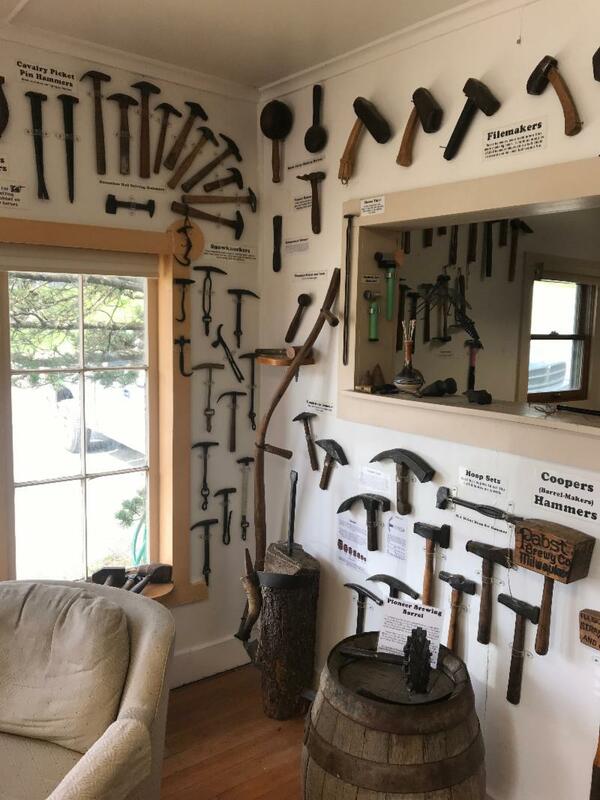 After an informative conversation with the museum’s owner about Wubbers, an invitation was graciously extended to Patti for the admission of the Wubbers Artisan’s Mark Hammers to grace the walls of the museum! The hammers will be packed and shipped off in the weeks ahead. Patti does not know the next time she will have the opportunity to visit the Hammer Museum. So, if you happen to find yourself on an Alaskan cruise and your ship docks in Haines, be sure to plan a stop the museum for us. Then, take a picture and send it our way! 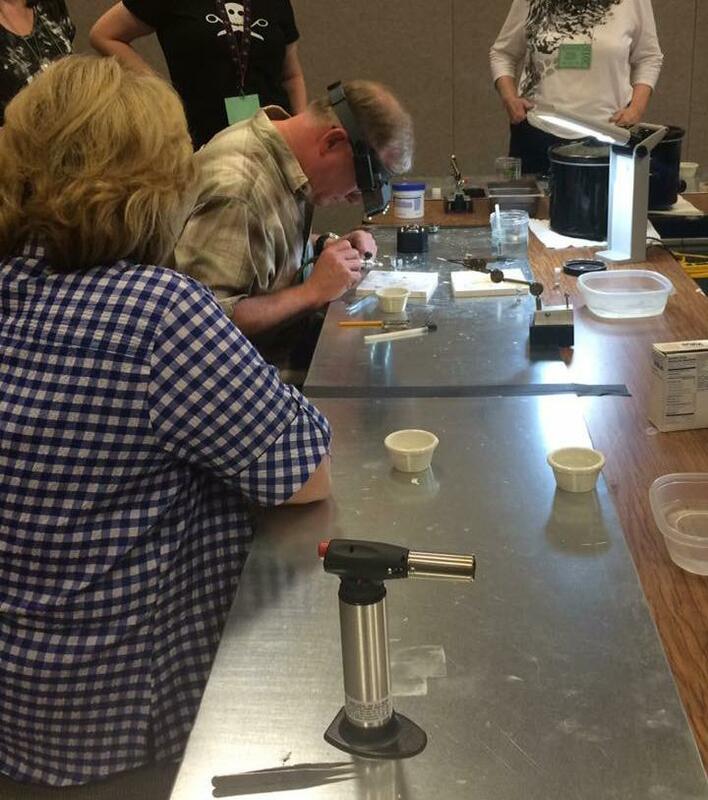 One way to expand your jewelry making business or help fund your hobby is to teach jewelry making classes. I’ve taught jewelry making classes in a variety of venues, from home parties to national conventions and have been a student as well. 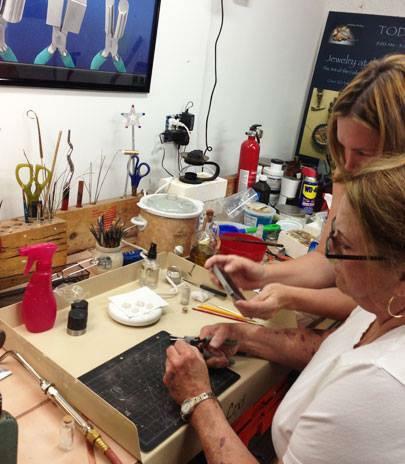 Teaching jewelry making classes takes your maker skills in a whole different direction. You have to break down the process of making something you know very well and present it in a way that makes sense to your students. Preparation and communication are the keys. Students will need a supply list ahead of time so they have what they need for class. 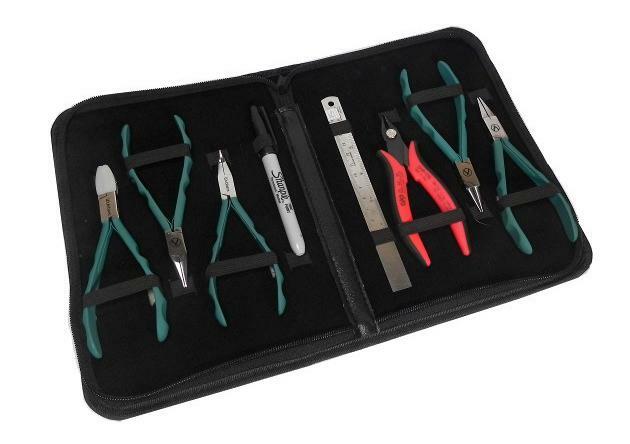 In addition to specific materials like 1-ft of sterling silver wire, it’s also helpful to suggest tools like the Wubbers ProLine Travel Kit and Free Zipper Case because students take your recommendations seriously. You’ll also want to send students an email reminder before class that includes general information like, “our classrooms are cold, be sure to wear layers,” or other relevant tips that will help them feel comfortable and successful. On the day of the class, set the stage by welcoming everyone as they enter the studio or classroom. Provide a step-by step handout that they can use to follow along and make notes, making sure to include your website and social media contacts and hashtags. Encourage students to look at your class samples as they’re settling in. Once the class is rolling, be ready to interact with students at different levels of expertise. Some people will need a very elementary introduction to what you’re doing, while others will really want to pick your brain about your techniques. Roy Talahaftewa providing instruction to a student. After your class, it’s time to reach out to your students again with a quick survey and request to join your email list and/or follow you on social media. Include links to your next classes and online shop. Share photos that they can post on their social media. Remember to make notes to yourself about the class so you can be even better prepared next time. And, be sure to unpack right away so you don’t end up like me – I have a class box still untouched from 2015! Once you unpack, you can even offer any extra materials for sale in your post-class email. 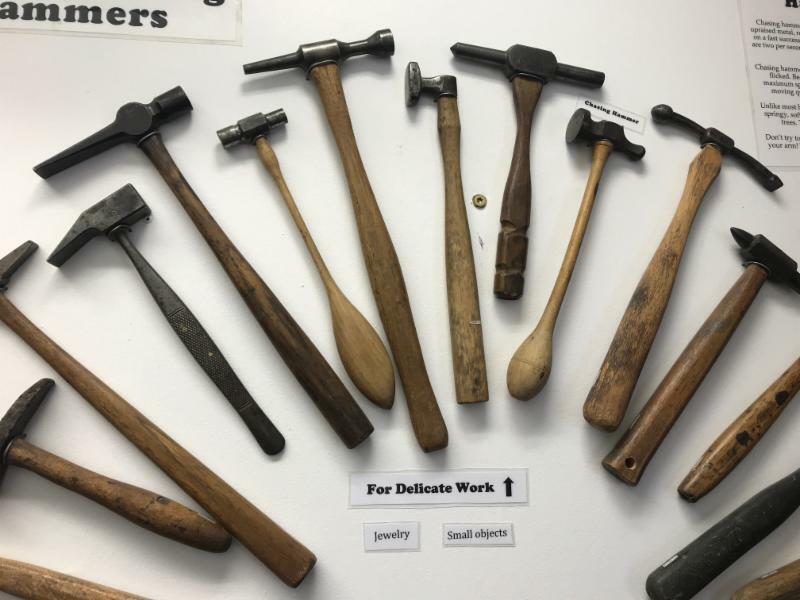 Whether teaching jewelry making classes adds an income stream to your jewelry making business or helps supplement your jewelry making hobby, it’s a great way to expand your skills and share your passion for making jewelry. Thank you for this wonderful article, Katie Hacker! 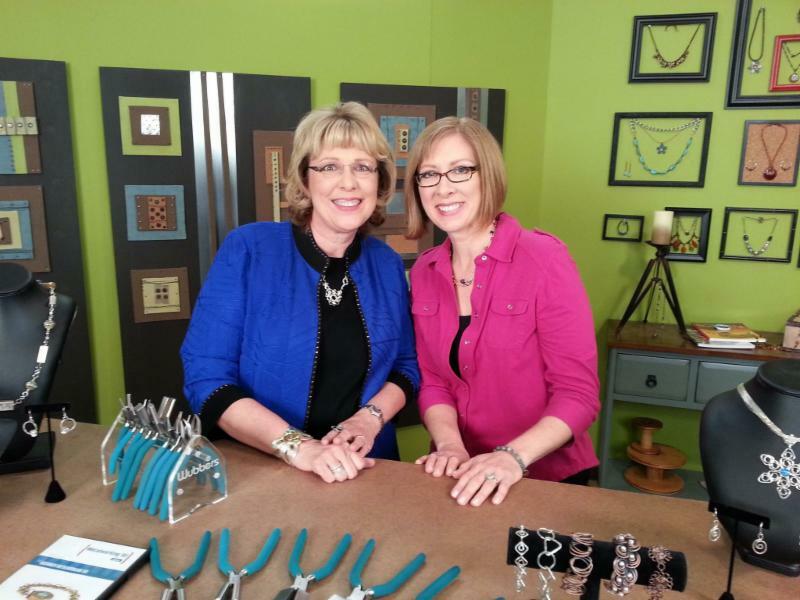 Katie is the host of Beads, Baubles & Jewels on PBS. She specializes in bead stringing and wire-wrapping – and she might start unpacking that class box soon.